The prompt for Carry On Tuesday this week comes from The Open Door by Elizabeth Maguire. Lloyd pushed Carrie constantly. To try harder, to focus, to step outside her comfort zone. At first she thought it was a good thing, it stopped her mind from wandering, it stopped her from seeing the different shades of sunlight flowing like ribbons under the door. Lloyd got things done. Everybody said so. He was a go-getter. He was going places. Carrie was fortunate because she was going to end up some place wonderful because of him. They already had a house. They already had a car each. Carrie had a string of pearls and a diamond ring. But it never seemed to be enough. It never seemed to stop; Lloyd’s quest for acquisition. Sometimes Carrie asked him when it would end. When they would be able to just sit and drink tea in the garden, listen to the birdsong in the late afternoon. His answer was always the same – I want. I want. When I have all the things I want I’ll have reached the place I want to be. The shift happened gradually at first. Carrie’s perceptions began to change. She saw a bee immersed in pollen. Yellow droplets fell like gold dust. Its wings were clear as glass, so tiny yet so powerful. She saw droplets of water on rose bushes, mesmerising orbs reflecting the colours of the morning. Carrie’s heart soared. There was so much to see just walking from here to there. Why had she never seen it before? Why had she never noticed? At lunchtime she sat in the park for the first time in two years. That was when she noticed the bird. The little bird with blue-grey wings. He hopped around her feet, looking for crumbs, regarding her with a quizzical eye. On the way home it was still light enough to see the shadows turn amber against garden walls. A little boy walked with his dad. He was skipping through the patterns left on the footpath by the setting sun. ‘We’re having a good walk, aren’t we, Dad?’ he said. His dad nodded, ruffling the boy’s hair. That night Lloyd spent over three hours on the phone and in front of the computer checking his investments. Carrie hadn’t realised but she spent most of her nights alone. Lloyd was there but he wasn’t present, wasn’t engaging with her at all. She spent the night watching reality TV shows and drinking wine she didn’t even like because Lloyd said it was the best. In the morning she woke at 7AM. Lloyd had already left for work. An emptiness began to settle in the pit of her stomach. She began to fear that this was all there was. The wanting of things. She heard a bird sing outside and caught the flutter of blue-grey wings out of the corner of her eye. It was dinner at Sophia’s house that changed things for good. It was as if a high, blustering wind had suddenly dropped and the road ahead was calm and clear. Carrie sat, her fillet of venison untouched on her plate, looking at all Sophia’s dinner guests. They were perfect under the carefully recessed lighting. No one needed botox when they sat at Sophia’s dinner table. Carrie felt a hand clench and unclench in her stomach. The venison was congealing on her plate. She got a glass of water from the kitchen thrusting her face into Sophia’s vase of cherry blossoms. They were made of silk, smelling faintly of dust. In the morning Lloyd’s side of the bed was rumpled and hours cold. Carrie saw the blue-grey bird sitting on the garden fence. He preened himself briefly then flew off. Carrie thought he was heading south. It took her less time to pack up the car than she had thought. The sky looked like it was made of water, undulating like a river. The maple trees thrust rusty light on to the road. Carrie left Lloyd a note. ‘The story is in the journey, not the destination,’ it said. She turned the key in the ignition. 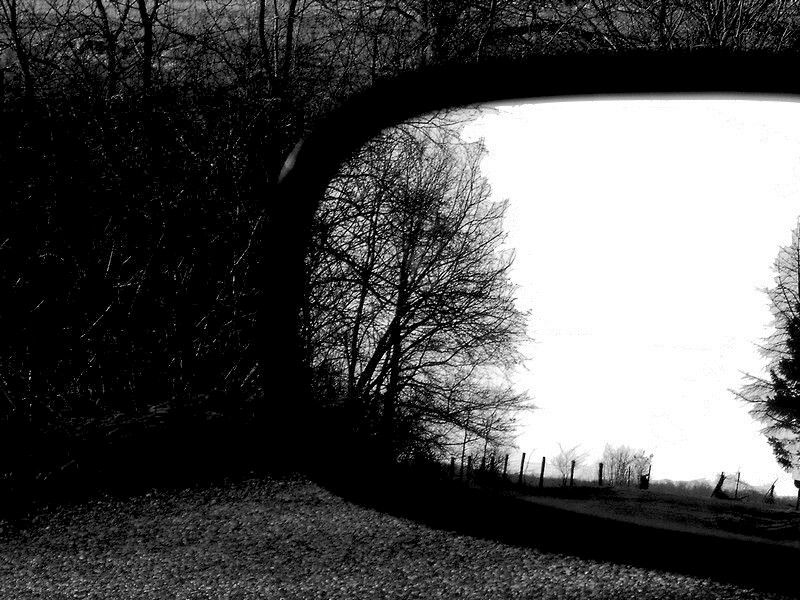 She saw the house – Lloyd’s house – in the rearview mirror. It meant nothing. It could have been a picture in a magazine. Carrie had decided that when she pulled out of the driveway she would not look back until she left the city. She drove as buildings with thousands of panes of glass threw mosaics on to the windscreen. She drove until the traffic cleared and the houses spread outwards to the bush. She drove until all she could see was trees. Then she knew it was safe to look back. The story had begun. Bravo! We should all have such clarity of vision, and you put it out there so brilliantly! I love this so much. Reading it was like eating it, which I know is weird, but…wow. Wow! “It is all about the journey not the destination” – so true! I wish I had such clarity of vision myself. and was able to act on what I saw ie. using it to change my life. Sometimes my characters have more courage than I do. I am so glad you liked it! Great to have you back. I’ll leave a comment on your blog re. this but I just wanted to say how much I enjoyed your story. You are a woman of many talents! I totally dig that comment because I have thought it several times when reading writing I love. WOW. Just about the ultimate accolade! At the end none of us wish we’d spent more time in the office, but we might wish we’d enjoyed a few more sunsets. I want to enjoy as much as I can of this beautiful world! Thanks so much. That means a lot to me! wow a power play, both from the story and the writer. very nicely written. you just received the Old grizz 3 bravo award. An ending can be a beginning. This is without a doubt my favourite story of all the ones you have written Sel. I savoured every word and could relate perfectly to how Carrie felt but for different reasons. Bravo my little mate. I accept that award with pleasure. That really means a lot. Thank you! An ending can be a beginning, for sure. And sometimes if we take time to look around we can see there is more to life than we thought. Glad you liked it. Definitely words to live by. I need to remember that more often. Thanks for your kind words, hon! I wanted to highlight that the reason they parted was due to a change in perception rather than a traumatic event like infidelity. I like how you describe it as not seeing the same road. That was it exactly. Thank you for your constant positive feedback! Glad she figured it out before anyone else was brought on the scene. Sometimes it was dead before it ever began, huh? That’s what I like about the line, “The story had begun”. It seems to me too many people are waiting for the story to be written, when all along it’s our story to write. I think that’s why I love the story Inkheart so much – it has that theme to it. 🙂 Great job! It definitely is our story to write and e shouldn’t wait, we should just jump in feet first. What have we got to lose?